Trackable actions. Those two words might just be the driving force behind every marketer’s career in 2016. Tracking actions allows for data collection, data collection turns into insights which in turn drive budget allocations, sales, and, ultimately, a company’s performance. Google Analytics is a fantastic data collection platform. It’s free for non-enterprise users! It’s flexible! It’s pretty easy to learn how to use. I would know. I’m a GA convert working at a company where our homepage literally says “Google Analytics” on the first button someone sees during a visit to our site. Call me a true believer. Google Analytics can do some great things. Experienced programmers and engineers can manipulate the system into doing truly incredible things. However most marketers are lower-need users and just want it to track the right actions to secure budgets, demonstrate performance, and benchmark company stats. Yes, I will touch on each metric and its importance. But first let’s talk about why these metrics are unavailable in GA.
Data is collected into Google Analytics via Sessions. A session can be composed of any number of actions but they all start with a user accessing your website and creating a data hit that your website’s tracking code passes back to Google Analytics to process along with associated data – like which source/medium drove the session (Google / Organic for example). Sessions can take many forms but all involve at least one interaction with your company’s website to trigger the on-page Analytics tracking code. The Session is key! All other data piggy-backs on the hits within your session to fill out your Google Analytics reports. The actions must take place on your website, or in connection with a website visit, in order to push data into GA! This is where we lose a few crucial AdWords actions. 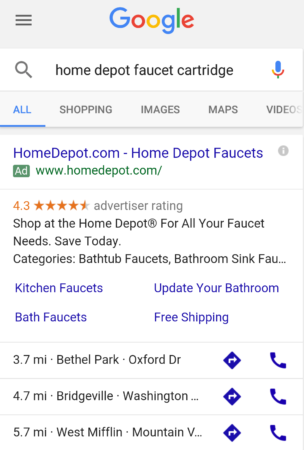 If I search for a replacement faucet part on my phone (example below) and I click the normal AdWords link to homedepot.com, I’ll go to the website. AdWords & Google Analytics will talk (via the GCLID tracking from AdWords) and Analytics will start a session, attributing actions I take to Adwords. However, if I were to click the phone or directions boxes, no session will be created. I don’t visit Home Depot’s website. No session is created and no hit is sent to Google Analytics. The action I took (directions or a call to my local store) express extremely high buying intent but they aren’t captured in Google Analytics. Did you see the asterisk in my post title (3 Key AdWords Metrics You CAN’T* Track in Google Analytics)? I added that because here at LunaMetrics, CAN’T is a four-letter word. I work with crazy-smart folks who can upload/code/customize/jam/insert all kinds of data into Google Analytics. Technically, you could collect the below data separately connect offline actions with a website visit or use offline actions to simulate a hit. Many things are possible, but today I’m focusing on AdWords actions that don’t easily fire into Google Analytics. There’s no better action for a user to take than to walk into a brick-and-mortar location. Once a user is in your company’s store marketing collateral, product inventory & helpful staff kick in to either convert or build a relationship with a potential customer. Amazingly, Google AdWords remembers when a user clicks on or sees your mobile search results ad then takes their mobile device into your store (Google has actually used this tech to map the interiors of most major buildings as well). We also know from internal Google data that about half of store visits happen within an hour of the search ad being triggered. Review Google’s qualifying criteria for this feature here. What’s missing? Well, there was no website session! Our user went from the search results to a physical location. Google Analytics didn’t get to fire a session or record anything about this critical interaction yet we as marketers want credit/attribution for driving this potential revenue. AdWords reports on Store Visits for applicable accounts, but it lumps them into the generic Conversions column. 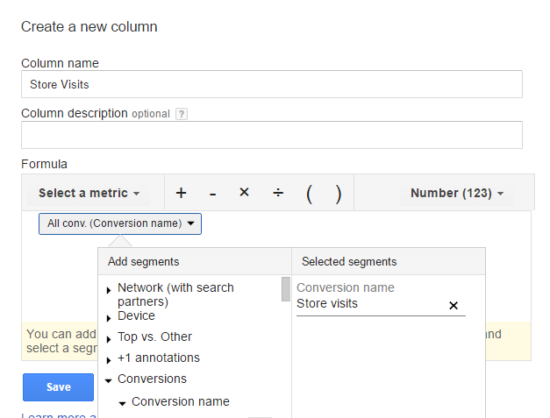 Select “Conversion Name” as your metric, scroll to Conversions>Conversion Name and look for Store visits. You can use the same process to also create a column for Cost per Store Visit, an immensely useful metric. Same story here. When a user clicks the Click-to-Call handset button in your ad, their device places a call to your business. We’re again missing a website session to piggyback data to Google Analytics. Not only would you need to create a specific conversion type in AdWords to measure the number of calls placed and use Google’s call forwarding masking service, (Details) you will also have to choose a non-default column to measure Calls outside of the dreaded Conversions roundup metric bucket. Look at all those options! Wouldn’t it be great to have PTR (Phone Thru Rate) in Google Analytics? 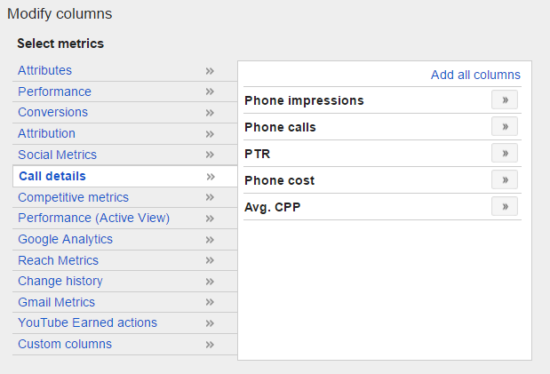 Pull it in AdWords for now if you drive calls from your PPC budget. Perhaps the most important of today’s 3 metrics, Impression Share helps you understand your reach in the search ad marketplace. Call it “Share of Voice”, “Market Reach”, whatever you’re comfortable with. Just don’t try to call it up in Google Analytics, because you won’t find it. 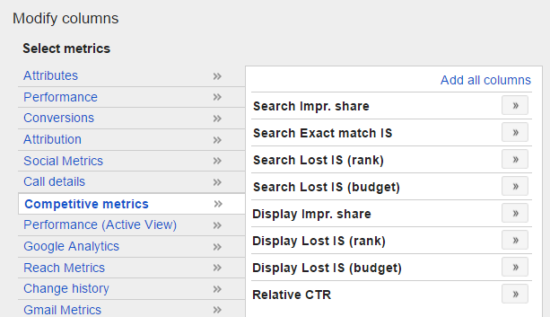 Impression Share metrics and particularly Search Impr. Share tell you what percentage of daily available queries your campaign/ad group/ad is serving for. With branded campaigns, this should ideally be 100% or a very high number. For highly competitive non-brand campaigns, this number might be lower. 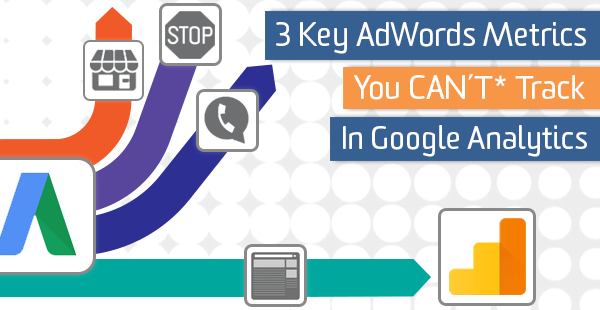 This number can help you secure more daily AdWords budget and estimate market saturation. Crucial stuff. Forget a website hit for Google Analytics here, these numbers don’t even report solely on your own ad impressions. They also include impressions your ad is not serving for but could be if your budget was higher. Search Impr. Share – In this case, the number above is account-wide. This account is missing about 40% of the chances to show an ad! Search Lost IS (rank) – 35% is due to Ad Rank (which involves Bids & Quality Score). Higher bids might help us make up the overall gap. Search Lost IS (budget) – In this case, very little of this account’s lost budget. Did I miss anything? Maybe we’ll see these 3 key metrics in Analytics someday soon! What other advertising metrics are missing in GA?